Highland Park is introducing a new series of single malts for global travel retail, inspired by iconic animals in Viking culture. The Orkney distillery is introducing four new expressions which will be available exclusively in duty free. Highland Park Spirit of the Bear is a no-age-statement expression matured primarily in ex-Sherry American oak casks, and bottled at 40% abv. Described as having notes of smoke, root ginger, nutmeg and vanilla, Spirit of the Bear will be available in one-litre bottles for around £44/ €50. Highland Park Loyalty of the Wolf is a 14-year-old malt matured in ex-Sherry American oak casks and ex-Bourbon barrels. Bottled at 42.3% abv, it’s described as exhibiting vanilla sponge cake, baked apples and cinnamon flavours, with a light smokiness. The expression will be available for £57/ €65 for a one-litre bottle. Highland Park Wings of the Eagle is a 16-year-old malt described as a ‘spicy and elegant’ whisky. Matured in ex-Sherry casks made from European and American oak, the expression is bottled at 44.5% abv and will be available for £79/ €90 for a 70cl bottle. Finally, Highland Park Viking Pride 18-year-old, which is available in domestic retail, will make an appearance as a 46% abv bottling – as opposed to the 43% abv version available elsewhere, and is described as a ‘naturally darker whisky with a fuller flavour’. The new range has already been launched in European travel retail, with Viking Pride set to join the collection later this summer at £100/ €110 for a 70cl bottle. The collection will be rolled out into Asian and Middle Eastern sirports from September, and into the Americas from December. 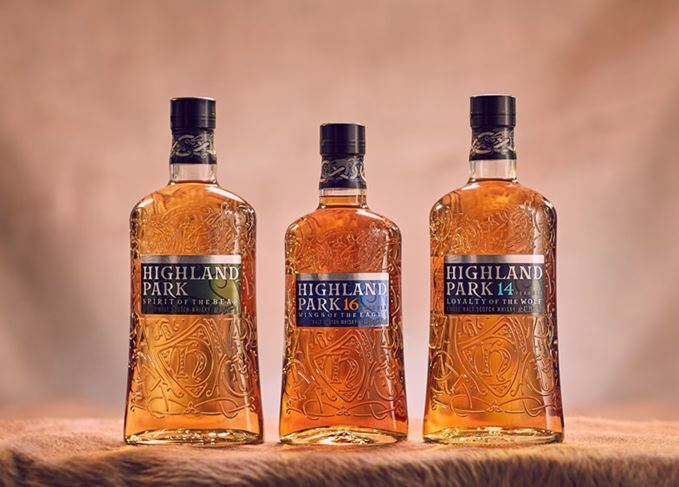 The launch of Highland Park’s travel retail range follows a complete makeover for the brand in 2017, with the introduction of a new bottle design and limited editions.